AT Represent your favorite NFL team with a durable cover that personalizes and protects. While supplies last. AT&T Wireless: No coupon code needed. Tap to shop the sale now. AT&T Wireless: Tap offer to copy the coupon code. Remember to paste code when you check out. Online only. AT&T Wireless: Get a $100 Visa Reward Card when you order internet online with 12 month agreement. Reward Card Will be sent letter with redemption requirements. Redemption required within 75 days from reward notification mail date. Card expires at month-end 6 mos after issuance. AT&T Wireless: Looking for something else? See a list of AT&T offers, codes, in-store coupons, and more! AT&T Wireless: Choose a package with Free Phones & Accessories or get the Best Deal on a hot new smartphone package. Prices starting at Free with qualifying plans + Free Shipping. Limited time offer. 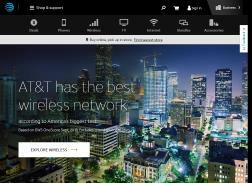 AT&T Wireless: Sign Up For At&T Email and get the latest on hot deals and cool, new products. AT&T Wireless: New year, New Gear! Get 30% Off Any Case, Screen protector, or Charger. Other restrictions may apply.